How can I purchase an ad free version of Words with Friends? I had to delete the app because I couldn’t bear the awful pop up ads. But I love the game and happy to pay - is there not an IOS version available that is ad free? We appreciate your love for the game, @newton. 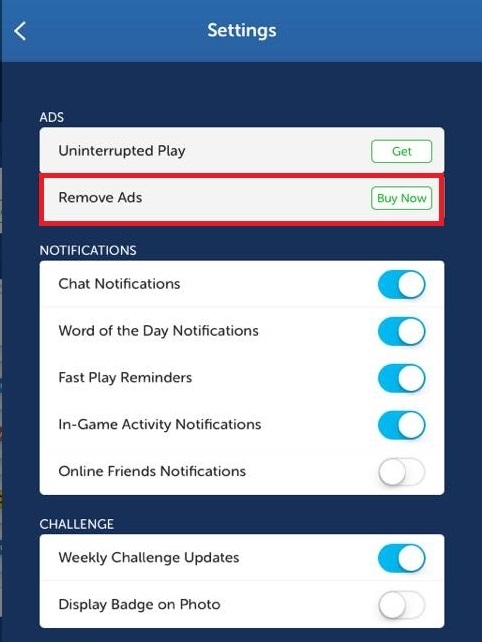 The "Remove Ads" feature is unavailable on the new version yet, but we're already working on making this available. Stay tuned for updates. As for the old app, this is still available for purchase. Check the image below for your reference. Thank you. Thanks so much for the reply! Weirdly, I don’t even have an “ads” section option in my settings. I’ve tried deleting and reloading the app, but in my settings, I only have notifications, legal, challenge, sounds, privacy and languages. I’ve gone into every option and there is nothing about ads anywhere? Is it only me having this issue? I have this problem too. I'm on a pixel with android. I can't find the remove ads setting, I can't even find settings for WWF2. Please help. I even need the paid version or have to uninstall because I can't deal with the 30 second ads after EVERY move! @kkathy The option to pay for ad-free is not available in wwf2. They might bring it back eventually but it's not there right now. thanks linkshighlights! I'll just have to wait until they bring out the android pay version. The ads are too time consuming. The option for removing the ads have yet included in the new version, @newton. Other players were also requesting for this feature. We can help in forwarding your feedback to our developers. As for your concern, @kkathy, the virus ad on the image you provided is a non-Zynga concern, but we can try passing this on as well. We suggest that you close the tab to make sure you're safe from irregular activities. Words2 —Yuck! Intrusive,busy interface. Constant pop ups. If you breath on the screen, some silly thing pops up. I don’t want any sprockets or whatever. Just give us our game back. And Now you can “buy” free swaps. How does that enhance real competition? And why doesn’t the Words2 icon on my iPhone show the number of games waiting for my move as it did in the prior version? You call this mess an update? Would go back to the old version but the constant interruptions pushing me to update drive me crazy and “return to [email protected] brings you to the new version anyway. decided recently to join my wife on WWF. She purchased the ad free version sometime ago and I thought that my version downloaded from the same itunes account would likewise be ad free. I complained to Zyngs via ird help page and following a response I provided proof of our ad free purchase. I understand that family members do not need to pay multiple times to use the app. We naturally use different log on credentials. I proved the proof of purchase on 29 Dec. No response received. I have uninstalled, app and reset my iPad. For one brief period I was ad free and then it reverted. These ads drive me crazy and totally detract from any playing pleasure such that I have stopped playing. I am annoyed and frustrated by this whole process and not at all happy that Zynga have not even given me the courtesy of a reply. Apologies. We'll make sure to share your feedback with the team. Nonetheless, please send us a follow up query by following the steps from this link for faster response and assistance from our Support. Thank you. Another one chiming in on how terrible the ad experience is. Going to finish up my current games so as not to be rude to my opponents then am quitting until you can offer a game that doesn't aggravate me so much that I want to throw my phone out a window. When will the ad free version be available? I'll be going back to Scrabble until then. From the other comments here, looks like this has been as issue for seversl months. Which most likely means that you have no intention of offering the ad-free version, because enough users don't complain about the ads, and you're making more $ that way than by offering a better game experience. Have you ever considered the larger impact of advertising on people? It makes feel negatively towards your advertisers and Zynga when it's executed so poorly, and with no option for removal. I had to delete the app because I couldn’t bear the awful pop up ads. But I love the game and happy to pay - is there not an IOS version available that is ad free? Me too. I want to buy and ad free version. I love this game, but if an ad free version doesn’t come soon, i will stop playing just because of how annoying it is to try and play and have to wait for a 30 second ad to play after every single move. Please please please let us buy an ad free version. Thank you! So here is my experience. I had purchased the ad free WWF about 4 or 5 years, and 2 phones ago. I have never had a problem with my Words experience. When WWF2 came out I was told that I would be 'grandfathered' in and get to enjoy an ad free experience...WRONG. The new Words had constant ads...bad horrible ads that destroyed my battery and the storage on my phone. So I ignored the new app and continued to play on the old Words. 2 days ago both versions updated on my phone and NOW I have ads on both versions. I reached out to ZYNGA for help and a rep by the name of Anthony N reached out and told me that the only way they can help is if I screenshot the receipt from my orginial purchase 4-5 years ago! He also told me that clearly I entered my new info incorrectly into Words 2 otherwise it would've been ad free. I tried to explain to him that I reached out when I first installed the game and Zynga answered me once and never again just like this instance. Seriously is this how loyalty is treated? I have been an active player and have referred countless friends to play this game with me. It is horrible that this is how you treat your veteran players. Zynga should be ashamed of themselves for taking advantage like this. If this isn't resolved soon I will sadly have to quit this game. well I guess one more player complaining will not make any difference to you! as I have read all the prior players complaints,yet I feel I must add myself to the list! perhaps if enough of us complain ,then you might listen! Stop the ads! so horrid! I will not ever (at least to my waking knowledge ) use any product that is depicted in these #$+-#@ ads! Please release ad free version. I'd pay $20 to not look at all these freaking ads. I don’t like the ads either. However, I was very unhappy to have a political ad come through the other day. This is not the place for that. Even more disturbing was that it wasn’t just a pitch for a candidate. It focused on only one of this candidates issues. If I continue to see anti-abortion ads on words for friends I will go to one of my other games and delete this app even though I really like the game. Please fix this ASAP. Hi. Ive been playing Words with Friends as long as it's been out, and so I'm grandfathered in to the advertising issues as I bought the Ultimate Games Pack years ago... But now I've got a kid old enough to be playing (he's almost 7), and so his installation is new, and he's being subjected to surprisingly raunchy gambling and disturbingly violent game ads when he makes moves. What version of Words can I actually purchase? I don't care about any other features. He loves the game and recently got a 50 point word and was over the moon! And he's learning sportsmanship and etiquette and lots of great things as well as vocabulary and spelling... but there's no way in **** I'm letting him be subjected to that kind of stuff. I know you have to make your money, and I will gladly give it to you. Please tell me how. I’m in the same boat you are. I’m grandfathered in, but my kid can’t buy an ad free version of WWF. A good alternative, but with fewer features, is Wordfeud. The ad free version is $3. My 90 year old mother has been playing WWF for some years now, and it has become her lifeline to some of her kids and friends who are long distance. Her mind is now starting to lose it's sharpness and the ads are confusing her, as she can't find her way out of them. I set up her Android with a remote "TeamViewer" app, which allows me to see her screen and help her out of her jams from a distance. Last night even I was unable to get out of a Google Play ad, and ended up having to shut down the device to get out . . . infuriating. Sad that a game that is enjoyed by so many, is now so polluted with ads that it is becoming a source of frustration. We would happily pay for an "Ads-free" version, but apparently that is not an option. What's up? I’m grandfathered in but have noticed an ad in the banner. I’d pay handsomely for a “no add”, “no power-ups” version. Zynga, are you listening? Just wanted to add my perspective as a new user. I recently decided I should play a words game and so I don’t have any attachment to WWF. Ironically, the WWF2 app served me with an ad for the nytimes crossword app which I hadn’t heard of before. I highly recommend it. I don’t understand how Zynga’s marketing can believe I will pay 120$/year for this game to be tolerable. I feel sorry for all the loyal players whose complaints are so shamelessly ignored. Oh. That’s news to me. Zynga is now offering ad free WWF for $120/yr? That is a pretty ballsy move. I do believe Zynga should go to a subscription model, but I was thinking maybe 1/10th that price. Like $12 a year. I play this game intermittently because the ads kill it for me. I'd happily pay for an ad free version. I'd probably pay $12/year for it! Please make this happen. I'm slowly losing my mind at these ridiculous ads. Zynga.. not exactly an ethical company really. They like to take your money but then shut down the service. Draw Anything 2 anyone? I like how they don’t even bother responding anymore. I literally can spend 5 seconds making a move to be followed by a 15 second commercial. Repeat. Repeat. This is why I’m moving to scrabble. Buh bye.